After the order is placed you can send the photo you wish us to use in the video by email. High quality photos are best and must be facing straight forward. Please include Dad's name and the DVD ordered. 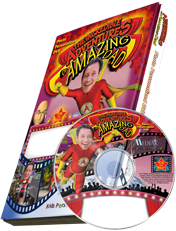 This Personalized DVD features every special dad as "Amazing Dad". Surpass multiple simulations, cease all Professor Nasty's antics, and become the world-acclaimed hero. The fierce action and fearless demeanor displayed provide lively adventure. This video conveys every special dad's heroic qualities such as courage, confidence and ideal leadership. Dad's picture is used 41 times. Length of DVD is approx. 22 minutes.